My “wired” fox terrier howled at 4.00am this morning. There was nothing afoot except maybe that he had an incandescent urge to look at the stars. Or maybe he too was having nightmares about shrinking global zinc inventories. I was up and about and thought maybe I should just write a few lines. It has been about four months since my last confession. The zinc price was at $1,850 per tonne then in early June and now it is $2,323 per tonne. This most recent price surge is a delayed response to mine closures. The mine-supply shortfall is now finally feeding through the system. I realise that a few of us have been like voices crying in the wilderness but the wolf came in the end. Global stocks are now at 750,000 tonnes of zinc metal or just 18 days of global consumption. Three and a half weeks has been a tipping point in the past. There is finally a realisation that quality is poor in the corral of mustangs. Maybe a couple will be broken in as the best of a small herd. Is this group of mangy piebald what the next generation of mines depends upon? I have been to Turkey three times over the summer. There in south-central Anatolia I saw drill core of massive zinc mineralization. It was limestone once. The limestone was completely replaced by zinc and sulphur. At improbable grades above 60 percent zinc. Why improbable? Because stoichiometrically this mineralization represents almost saturation levels of sphalerite. Sphalerite is a zinc sulphide mineral. It is a beautiful and extraordinary thing to see. These small but ultra high-grade zinc mines are in the Taurus Mountains north of Adana. Adana in south central Anatolia has a population of 1.7 million. It is the fifth largest city in Turkey. Cicero when he was 55 years old took up the position of proconsul of Cilicia for a year from May 51 BC. His instructions were to keep nearby Cappadocia loyal to the empire. He managed to keep the period of his rule calm during an uprising in Syria. Sounds familiar? There has been little exploration of this mineralized trend since Cicero was the proconsul. Geologists call these mineralizing systems Carbonate Replacement Deposits (CRD). Zinc is one of the more mobile metals in hyrothermal systems. It finds its way out to the margins of CRD’s. At the tips of the tentacles of these systems a prospector might find zinc carbonate. But that was only where the mineralization breached surface. And that is if they were looking. Zinc was unknown to Europe until the end of the 16th century so we find no Roman workings along this “zinc trend”. Who knows, maybe we are seeing the tip of the iceberg and somebody cares now. Adana has an old Stone bridge across the Seyhan River built by the Romans between 100 and 300 AD. This bridge was an important crossing of the Seyhan along an extension to the Silk trade route. The Silk route ran from Central Asia and through Aleppo in Syria to Antioch. Until 2007 this bridge was the oldest bridge in the world open to cars. It is now only open to pedestrians. I am busy now with like-minded souls exploring for zinc in Ireland. We are exploring around some historic silver-rich lead mines which punched through to surface. Methinks these old lead mines “pin” embolisms of zinc mineralisation at depth. Shallee is one of these old argentiferous lead mines in our sights. It is near the Silvermines zinc-lead mine which closed in 1982. We call ourselves Group Eleven (G11). Rumours of the demise of exploration are greatly exaggerated. Now the greatest gamble is not to risk. The sun has not set. It glints and winks as it slides along the horizon before the rising. Exploration is more art than science. Jean Cocteau said “art is science made clear”. Exploration is much more passion and imagination than sanguine calculation and choleric promotion. It is discovery and it is frontier beyond the familiar mind-set. It is detective work and the careful gathering of clues. Discovery is all about solving the crime. I had an eye test recently. I was prescribed a supplement with nutrients to help maintain the macula. The macula is a specialised part at the back of the eye responsible for our detailed, central vision. Zinc is a key ingredient as it helps maintain normal vision. I knew that zinc puts lead in your pencil but I never realised that it was so important for a healthy eye. It was the vision that zinc had run out which woke me in the night. Maybe I am taking too much zinc. 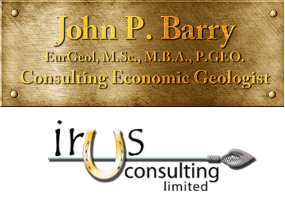 Disclosure: I am an exploration geologist, Chairman of Group Eleven Resources Ltd (G11) a private Irish zinc exploration company and a non executive director of Pasinex Resources Ltd (Canada – CSE).